What wisdom can equip us best for the journey of life? A young boy and his uncle are traveling across the desert in Egypt in 1934, on their way to Cairo. During a rest at a beautiful oasis, the older man decides to begin preparing his nephew for the future. So, as the days pass, they talk about such things as inner peace, the challenge of change, the dynamic nature of balance, how things can help or harm us, the true power of the mind, the hidden structures of our world, the importance of wisdom, the elements of human nature, the necessity of love, the requirements of success, and the world’s strangest gift of all - uncertainty. The boy keeps a diary. And what he learns on this adventure may be as life changing for readers as it is for him. Packed with insights for life and work today, you’ll find in this short tale a profusion of vivid images, profound reminders, and new perspectives that can help greatly as you grapple at the interface of desire and difficulty throughout your own journey. There is deep and simple wisdom to be gained about how to deal with the opportunities and obstacles that are everywhere in this world. You’ll find much of it here, in this brief but rich account of one remarkable trip. We can all cultivate the oasis within, of which this book speaks, and it will provide a source of peace and power that can lead to remarkable outer results. Recent readers of The Oasis Within, The Golden Palace, and The Stone of Giza compare the series to "The Alchemist Meets Harry Potter Meets Indiana Jones." Others note similarities to Dan Brown and even talk of "The Hardy Boys Meet Aristotle." One fan writes, "While reading the books, I felt like I was 13 years old again." Another says, "As I was reading these books, I felt just like I did when I was reading Harry Potter for the first time!" What's Published and What's Next? The Oasis Within is a prologue to the epic adventure series of philosophical novels entitled "Walid and the Mysteries of Phi." The series will consist of at least seven books. See the list below for publication information. Visit The Series Page for more on each book. The Oasis Within serves as a prologue to a seven book series. The first five of those books are now available at Amazon and elsewhere! 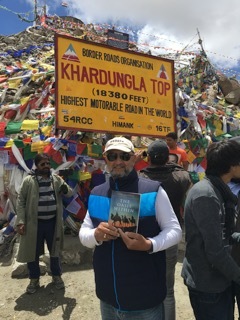 International businessman Vinod Rangra reading The Oasis Within in the Himalayas, at over 18,000 feet. Cultivating his own oasis. "Thank you, Tom, for writing this masterpiece for us. Full of words of wisdom that we can use in life." - Vinod Rangra, as pictured above in India. The Oasis Within is available online and through bookstores worldwide. To purchase copies, click the options below, or contact us through TomVMorris.com for any special large quantity orders of at least 100 copies. 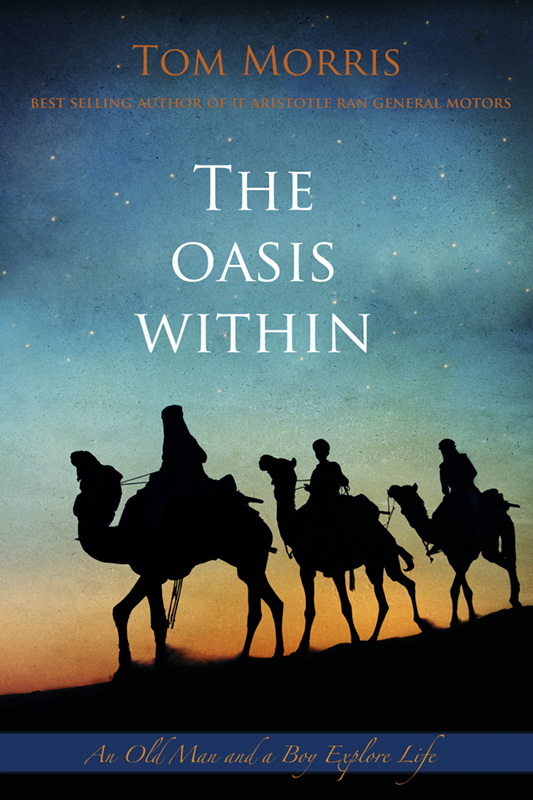 To get The Oasis Within at Amazon in Paperback, Hardcover or Kindle: Click here. Or, fast from Our Wisdom/Works Partner in Paperback: Click here. Next: The Golden Palace, Volume 1 of the series Walid and the Mysteries of Phi. The action starts two hours after the end of The Oasis Within. The adventure begins. The cast grows. And mysteries are revealed.